First up, the worst thing about the aftermath of New Year's Eve has GOT to be the raging hangover. I don't tend to drink all that often, so when I do indulge in a few too many wines (and let's face it, that is more than likely to happen at NYE) I always feel incredibly rough the next day. Thankfully, I recently discovered HangDr* - a vitamin and mineral supplement that you can take before a big night out to help battle the after effects of a heavy night of drinking - and it's changed everything. It makes me feel SO much better and more energised when I'd usually be lolling around in bed until the early afternoon. Definitely a must if you enjoy a drink! I think the best thing to do after New Year's Eve, and the best way to kick off the new year, has got to be running yourself a long hot bath in the morning, complete with energising bath bomb. I love the Mad Hatter's Tea Party Blaster* from Bomb Cosmetics - it's a sweet orangey mix that will leave you feeling ready for the day ahead. If there's one thing that's guaranteed for me after a night of heavy makeup and drinking, it's dull, sallow skin. The best way to counteract this? Origins GinZing Refreshing Scrub Cleanser*. Not only does it leave my skin feeling super smooth and glowing, it also makes me feel so much more awake - plus, it smells incredible. Another thing that comes with wearing heavy makeup, drinking too much and inevitably forgetting to remove said makeup is spots. I have them anyway, but they seem to get even worse after a night out. At the minute my go-to face mask for blemish-prone skin has got to be the Caudalie Purifying Mask* - it zaps spots and excess sebum, leaving your skin looking clearer and less oily. It also seems to really help the texture of my skin too - usually my skin is very bumpy and uneven thanks to having spots aplenty, but this really helps smooth things out. A shot of radiance is never more necessary than at this time of year, so Nip+Fab has come to the rescue with their new and ASOS-exclusive Glycolic Fix Radiance Shot*. Simply add a few drops of this bad boy to your usual moisturiser and you're good to go. It hydrates and protects the skin whilst leaving it looking and feeling smooth, radiant and shine-free. Glycolic Acid is one of my favourite skincare ingredients so this is definitely a big hit for me! 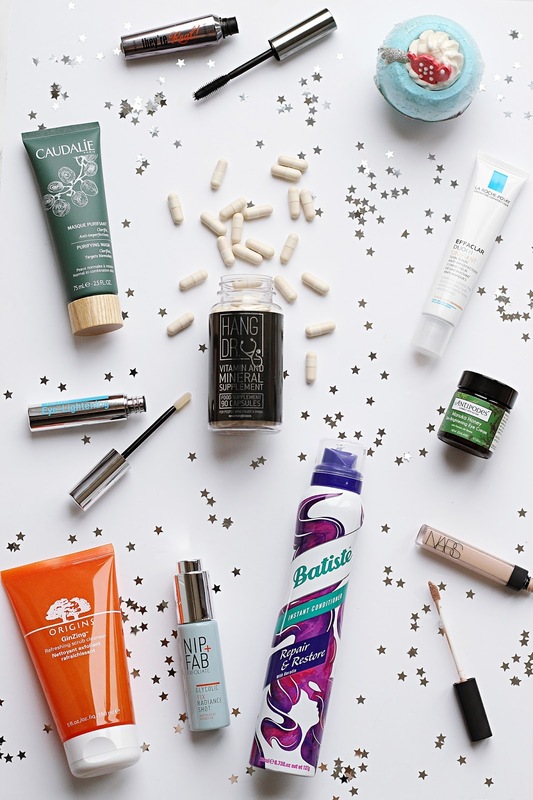 Everyone knows it's all about the eyes when it comes to looking and feeling more awake, so eye-brightening skincare is an absolute must post-party. My current favourite eye cream is Antipodes Manuka Honey Skin-Brightening Eye Cream* - it smells gorgeous and helps to plump up and hydrate the eye area leaving it looking much brighter and awake. For an eye-lightener, which actually claims to help lighten those dark circles with prolonged use, Transformulas Eye-Lightening Serum* might be worth a whirl - it helps to get rid of dark circles and puffiness, improves firmness and "de-ages" the delicate eye area. Definitely one to try if you suffer with really bad dark circles or are worried about premature ageing! A good, full-coverage, brightening concealer is obviously a must when it comes to getting rid of those dark circles, and my favourite all-year-round has to be the NARS Radiant Creamy Concealer. It's super full-coverage, blends beautifully and leaves the skin around my eyes looking much brighter. It's not the cheapest concealer out there, but for the results it gives it's totally worth it, and I always repurchase. Although putting more makeup on is probably the last thing you want to do come New Year's Day, if you have any family gatherings to go to or just simply want to look a bit more alive, the La Roche-Posay Effaclar Duo [+] Unifiant* contains a mineral tint to help give your skin some more colour and coverage, whilst containing the same master blemish-clearing formula of the original Effaclar Duo [+]. It's really lightweight on the skin and gives a decent coverage that is perfect for those days where you simply can't be bothered with a full face of slap but still want to look good, whilst giving your skin some TLC thanks to its spot-fighting ingredients. Although I wear lashes pretty much every day, I rarely put them on on hangover days because, well, effort. Instead I'll slap a bit of Benefit's 'They're Real' Mascara on because it's honestly the best lengthening and volumising mascara I've ever tried - perfect for waking those bleary eyes up on New Year's Day! My hair is always a knotty, matted mess in need of some serious conditioning following the use of all the hot hair stylers and hairsprays prior to a night out, so I'll help bring it back to life with Batiste's Repair & Restore Instant Conditioner*. This strengthens and restores hair, leaving it looking and feeling much healthier and smoother. Ideal for smoothing all of that post-partying frizz out! What are your must-have beauty products when it comes to a hangover? Let me know!